When we choose clothing, there are three qualities that affect nearly all of your wardrobe's appearance on your body. These three qualities are Fit, Fabric, and Feel. The garment will always looks good on the model in the picture—but does it have the right fit, fabric and feel for YOU? When you shop online for promotional or customized clothing, most of us will not know exactly what the fit of the garment will be. It can be hard to spot where a garment is either too short or too long; true to size; relaxes with wear; or may look slimmer in a smaller size. These factors might make it harder to determine if the product is right for you. Let’s use cotton as an example. Items like T-shirts and sweatshirts are made from knit cotton rather than woven cotton. Knit cotton creates a softer, looser, and more shapeless garment. Cotton will frequently be measured with a “thread count,” but this number can be misleading. The “handfeel” of a shirt is a better judge of how it will actually feel on the body. Our showroom allows you to personally experience the Fit, Fabric and Feel of the promotional clothing item you are interested in purchasing. 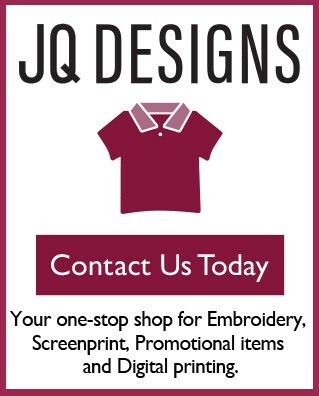 When you visit JQ Designs showroom, we can order a sample for you from our catalogs OR bring in a garment you found in a retail store and we will do our best to match the fit, fabric and feel from our promotional stock! We recently worked with client who fell in love with the fabric of a jacket, however there was not enough inventory because it was a very large order. Since there is no substitute for feeling and trying on the product, we ordered several different samples, and found the perfect jacket, with fabric our client loved in the right quantity! We also work with smaller quantities. Whether it’s an item you purchase from us, or your favorite garment that you purchased elsewhere, we are happy to decorate it for you. We want you to be comfortable in the clothes you wear—especially if they are branded with your logo. Our goal is to make you—and your name – look good. When the Fit, Fabric and Feel is right—we all look good!